The church of St Margaret's, Rottingdean seen from the west. The church lies adjacent to the village green and pond which tend to act nowadays as the focus for the village. Rottingdean is an ancient anglo-saxon settlement and there may have been an earlier church on this site as is so often the case with these ancient villages. 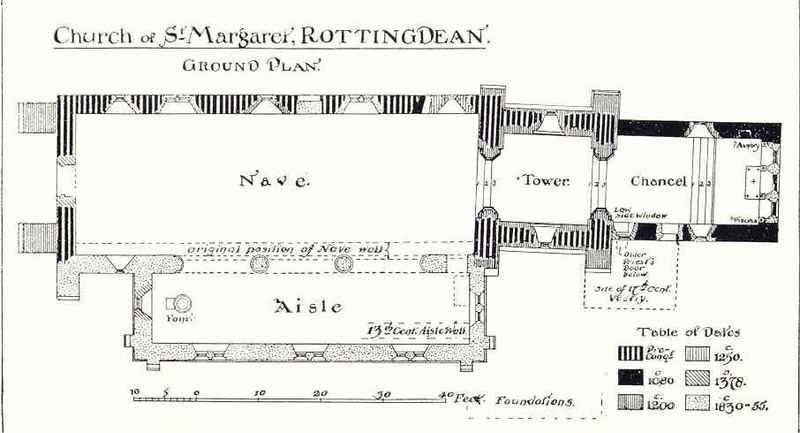 But most of this was likely to have been swept away in the years following the Norman conquest, when William de Warrenne, to whom the village of Rottingdean and adjoing land was granted, gave funds to rebuild the church in flint and Caen sandstone. 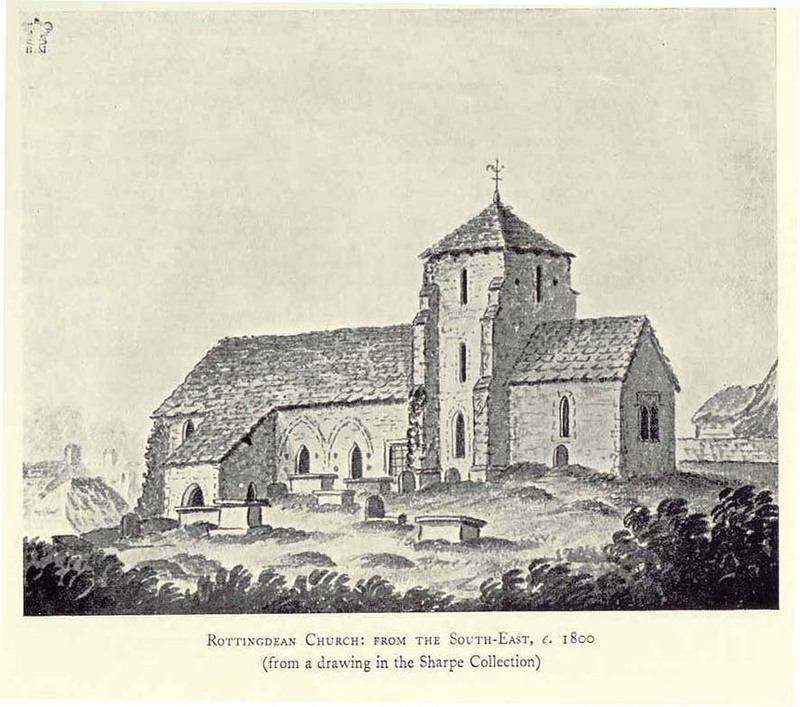 About the year AD 1100 a tower was erected on the present saxon chancel, where the present tower still stands, amd constructed a new chancel beyond it, and two transepts of similar dimensions. A view from the nave through to the tower and chancel: The church was to have a chequred history. In 1377, for example, the building suffered much damage during a raid by a large party of French pirates. The pirates intending to attack the city of Lewes landed at Rottingdean Gap and proceeded to plunder and fire the village. Those who had not escaped inland and who had survived took refuge in the tower only to see it set fire to. In the conflagration that followed the surviving villagers were burnt alive and the fabric much damaged. The side ailse and the roof of the nave, together with the west wall being totally destroyed. Many of the flints on the inner walls of the church were fractured by the intense heat, and the stone work of the arches and windows display that characteristic pink and grey colouring associated with burning. The stain glass windows: The seven stainend glass windows in the chancel and tower are one of the chief glories of the church. They were made by William Morris & Co from the designs of Sir Edward Burner-Jones and are generally recognised to be some of their finest work. 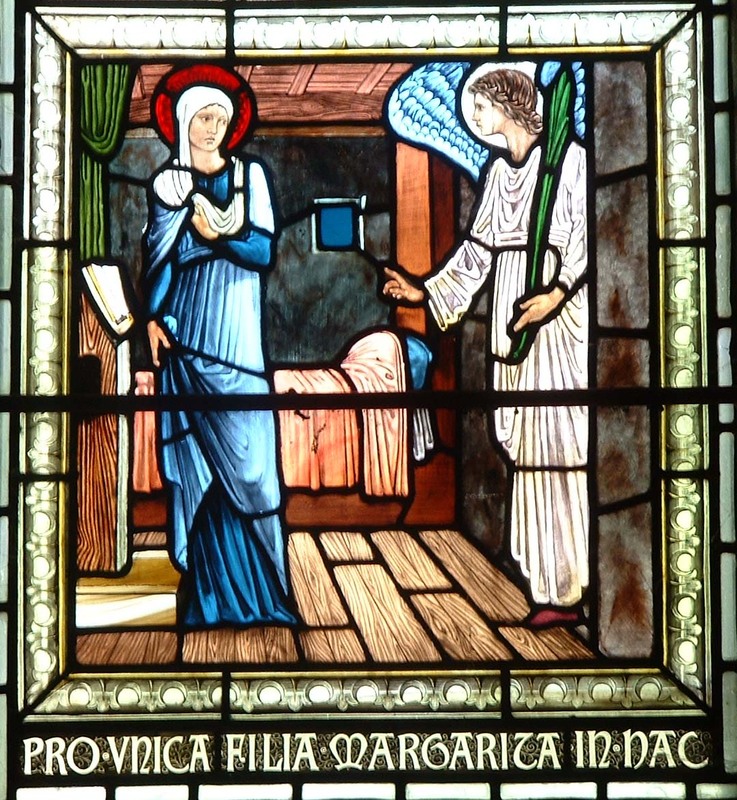 The three light east window in the chancel, was erected in 1893, to commemorate the marriage of Burne Jones's daughter, Margaret. 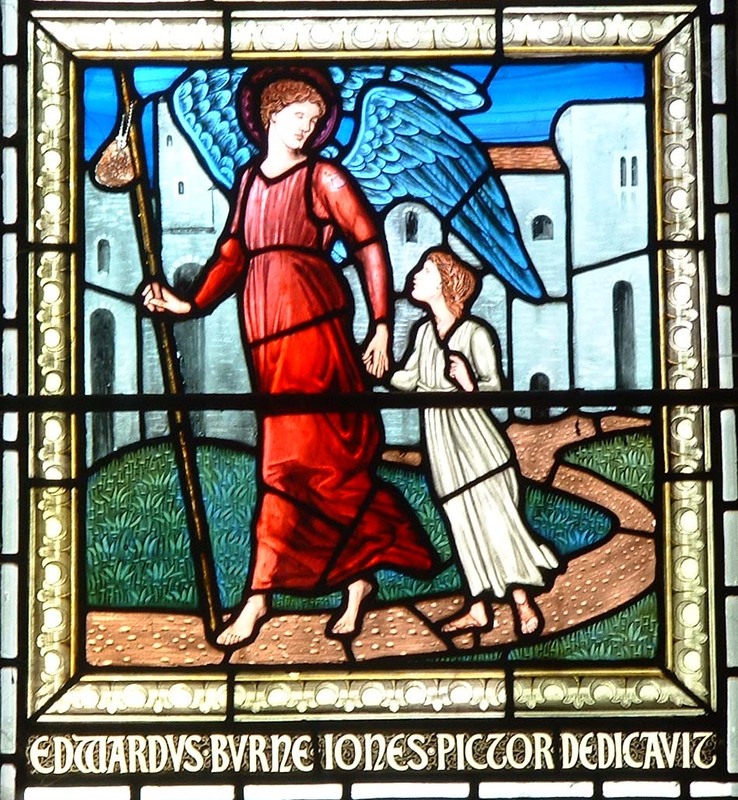 The Burne -Jones lived across the green from the church and were frequent visitors to the church. 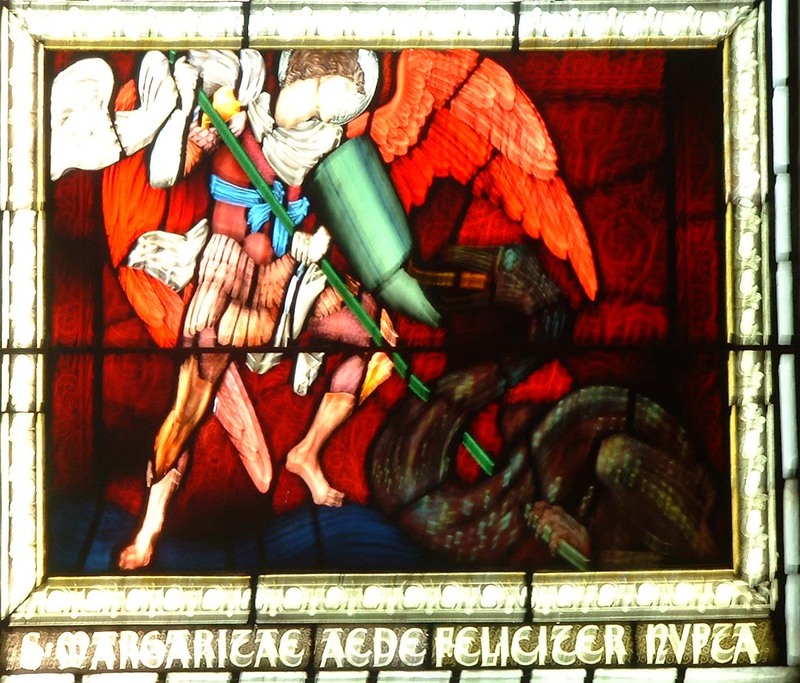 The window represents the three archangels, Gabriel, Michael and Raphael. Underneath are panels representing the Annunciation; Michael slaying the dragon and Raphael the guardian of little children. Prior to the "restoration" by Sir George Gilbert Scott in 1856 the east window had been a double light affair as the illustration of 1800 shows. St. Margaret: The patron saint of the church. This window in the north wall of the chancel was given Margaret Mackail, the daughter of Burne- Jones and the face is supposed to be that of Margaret herself. . This lancet window: in the north side of the tower was one of two given by the parishioners in 1897 in memory of the Rev. Arthus Thomas, and represents Jacob's vision. . There are two windows in the north wall of the nave that were made from designs by Sir Edward Burne-Jones and made by the firm of William Morris after the death of both the artist and William Morris. The first, representing St. Martin was erected to the memory of Mr. Edward Ridsdale (the father-in-law of prime minister Stanley Baldwin) . The South Aisle dates to the restoration work of Sir George Gilbert Scott in 1856. During the course of this restoration the ailse was shifted some two feet further southward and the large fire damaged columns of caen stone reerected to form the north wall of this ailse. At the same time one of the fourteenth century nave walls was inserted into the new west wall of this ailse. Befitting Sir Edward Burne-Jones's contributions to the church a small memorial is let into the south west wall recording where his ashes are interred. .